Brian McGrattan is no catch: the journeyman brawler has bounced around from team to team, and up and down from the AHL, since the lockout. So when the Predators waived him, he cleared easily. He was assigned to their AHL affiliate yesterday. This morning, Calgary traded for him. They didn't give up much, Joe Piskula, a 28-year-old defenseman with just 10 NHL games under his belt. But still—Piskula is a warm body, an actual human being who can play hockey. Why give up anything when the Flames could have just claimed McGrattan on waivers for nothing? 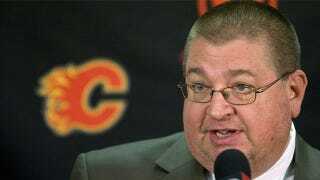 The easy and correct answer is that GM Jay Feaster is kind of a mess. One thought is that the Flames plan to assign McGrattan to their AHL affiliate, and had they claimed him, they would have had to put him through waivers again to send him down. But that shouldn't have been a problem—literally none of the other 29 teams in the NHL wanted him last week. It should be re-stated that McGrattan is not a good hockey player. The true reason is that the Flames are kind of maxed out. Teams are allowed 50 players under contract, and Calgary sits at 49. Moving Piskula is just a way to dump a contract. But again, it's Feaster's fault it's even come to that. And now comes word that McGrattan isn't AHL-bound, but is part of the Flames' plan to get tougher. You know, get some enforcers, protect all those quality scorers that the Flames don't have. Except McGrattan was with Calgary in 2009-2010, and was a healthy scratch most games. I've got my own theory on the move: Feaster wants to drop in the standings to improve Calgary's waiver priority. For next time.